Even without this perspective, though, Jeremiah was able to have a surprisingly hopeful outlook in the midst of incredibly difficult situations. 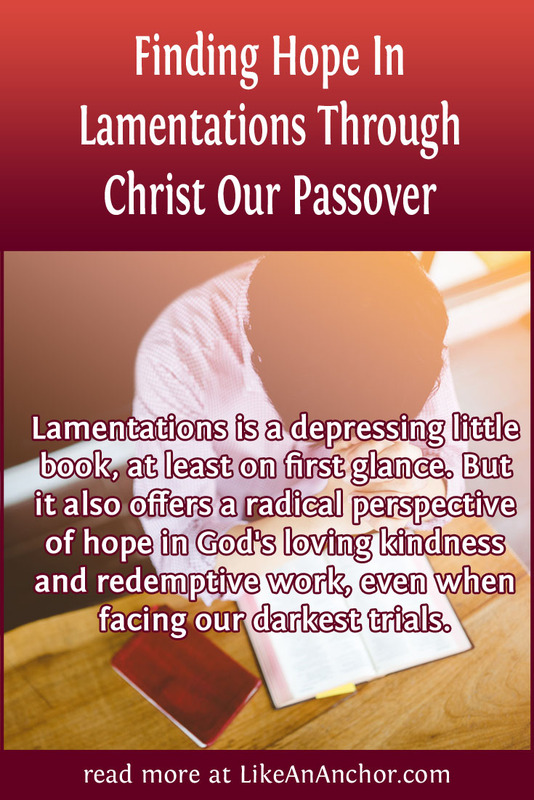 In the third poem, nestled right in the middle of Lamentations, we find a determination to continue believing in the Lord’s goodness no matter what comes. That’s an outlook we would all do well to imitate. This man whose world was falling apart around him had hope in Yahweh’s kindness, compassion, and faithfulness. And we can’t even handle getting stuck in traffic for 10 minutes or hearing someone express a political opinion we disagree with without feeling personally victimized. Jeremiah might seem unrealistically optimistic, but we’re the ones with a skewed perspective. Patience and hope are vital aspects of a faithful life. “Faith is the substance of things hoped for, the evidence of things not seen” (Heb. 11:1, KJV). If you only believe when things are going well and you can see how God is working then you don’t really have faith. Faith is holding on when you can’t see what you’re waiting for. It’s maintaining your belief in God even when you don’t feel Him moving. We cannot afford to lose hope or get impatient no matter how long it takes for God to respond. Christians are promised a life of suffering. That’s something we rarely talk about in the American churches, but it’s something many of our brethren in the rest of the world experience as a daily reality. We’re even told in scripture that we were called for the purpose of enduring suffering, following in Jesus’s footsteps (1 Pet. 2:19-25). We need to resolve never to give up our faith and hope when trials come. 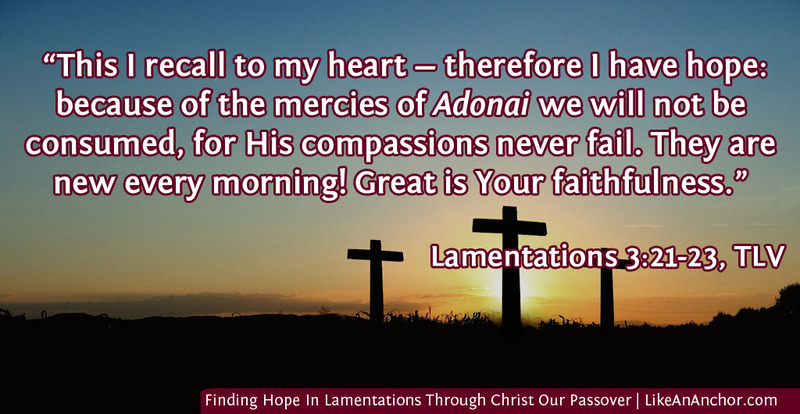 Trials give us the chance to participate in Jesus Christ’s sufferings. They also act as a teaching tool. God doesn’t allow bad things to happen because He’s vindictive or enjoy’s crushing us. His goal is always to lead people to repentance and a deeper relationship with Him. God’s not in the habit of torturing people. He does, however, let us experience the consequences of living in a fallen, sinful world. That includes the consequences of our own sin if we, like the people of Jeremiah’s time, turn our backs on Yahweh. When we return to Him, He offers grace to take away the eternal consequences of sin and in many cases he also extends mercy to alleviate our suffering here on earth. Jeremiah’s reminder to search our hearts is always relevant, but especially so as we get closer to Passover (which is only 4 weeks away as I’m writing this). In 1 Corinthians, Paul gives us several reminders to get ready for this holy day through self-examination and repentance, just like Jeremiah talked about in Lamentations (1 Cor. 11:26-29). The only way for human beings to become spiritually clean is through Christ’s sacrifice. Our role in this is simply to recognize when we need washed and turn to Him. Even after we’re saved, we can stray away from following Christ the way we ought to, and we need to keep coming back. Passover acts as a yearly reminder of the need to search our hearts. It also gives us a chance to ask God to search us as well and to show us what He finds. Our hardships are meant to bring us closer to God, just as ancient Israel’s punishments were designed to turn her back to true worship. We would do well to follow Jeremiah’s example of clinging to hope and looking steadfastly to God through all our dark times, confident that the Lord’s mercy and loving kindness will bring us through our trials and into a deeper relationship with Him.